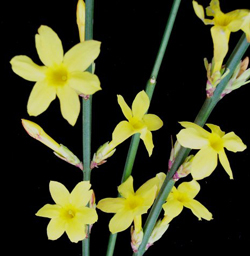 Winter Jasmine is native to western China and has been cultivated in the West since the mid 1800's. It has bright, glossy, green pinnate leaves divided into 3 oblong leaflets. We grow this winter hardy, vine-like shrub into tree form. Before the foliage appears this flowering beauty bears 1" bright yellow blooms at the base of its stems and slowly blooms up the stems. By late winter it flowers at the tips of the stems. Branches will root and produce new plants where trailing branches touch moist soil. Deciduous. Keep outdoors. Flowering Outdoor Bonsai Tree grown & trained by Bonsai Boy. May be shipped with no foliage during autumn and winter.